Hephesto's Forge: 2015 - VI - Slow an steady wins the race? 2015 - VI - Slow an steady wins the race? Not a whole lot to report on for this update, haven't had all too much hobby time these last two weeks. Though that certainly hasn't stopped me from reading through the Pulp City rulebook, which is quite a beauty. Really like the rules and models, not in the least as it's extremely easy to get going but very deep once you're actually moving around models and using all those fancy powers. The way you build your team of Supremes is also rather interesting. While the setting has tons of different factions, rivalry and multi-faction models, it really starts out as simple as deciding how big a team you want and whether you want Heroes or Villains. In other words, you can go super specialized but it's just as valid to pick up that one cool model you like from that other Hero of Villain faction. For me personally it's also great hobby-wise as I can simply pick up whatever model catches my fancy at that moment and feel good about finishing a function gaming piece. That's not to say I don't already have some favorite factions, with the Jade Cult pretty clearing taking the lead. Preparing several more models for them right now, but their iconic leader the Green Emperor is finish already. Currently also working on C.O.R.E., Dr. Mercury. Seabolt and some Ancklebiter minions. Though I generally can't help convert stuff, these models are pretty much all already perfect. So instead I'm focusing on making some custom bases, with Dr. Mercury pretty much my favorite model thus far. Even a level-headed scientist can only take so many Silver Surfer puns before he snaps right! 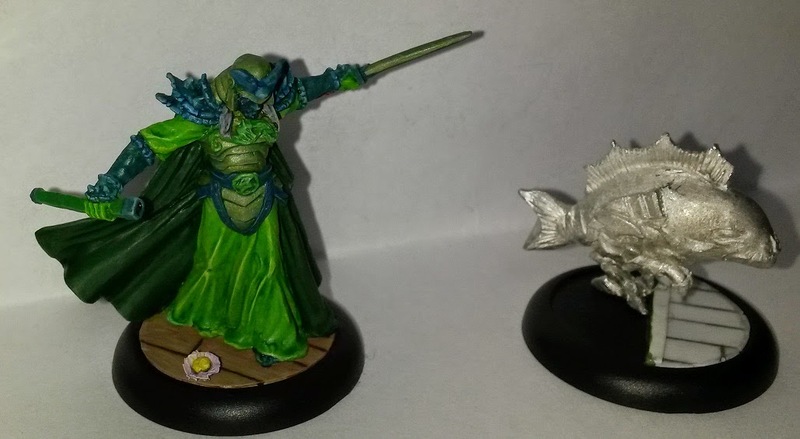 The Ophidian Alliance has been taking it slow this month, in fact I've only managed to finish the conversion work and undercoating on a spell counter model and a small archer unit. Does make it easier to decide what to add to next month's Mantic painting challenge. Also fun to see that the wip 2.0 rulebook has quite a bit of background already in it (link) and that Ophidia is mention! 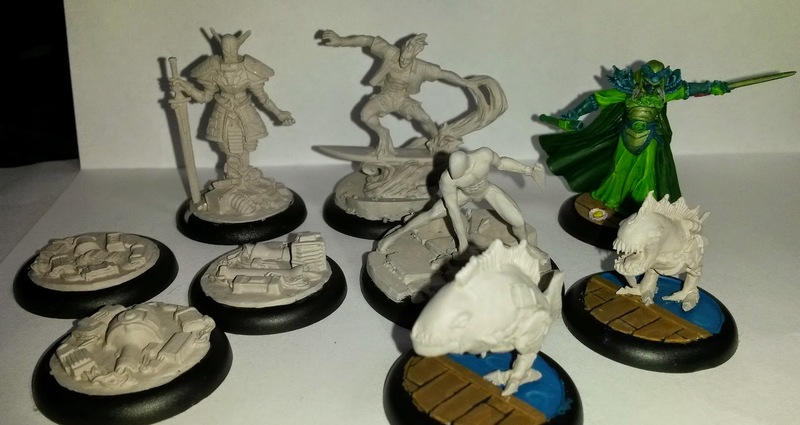 Still waiting for my Pulp City miniatures, ... And seeing yours makes the waiting that much harder ;). Lovely work on the bases. Especially the piranha's, looking as if they are emerging from the water.